Softgel CoQ-10 is the world's most comprehensive cardiovascular support supplement. It is also the best selling cardio-vascular prescription drug in Japan. It is widely recommended to repair heart damage and to boost the function of the heart, as well as in preventative use to safeguard against heart attacks and valve damage. It has also been shown to be beneficial in breast and lung cancer, as well as helping to maintain cognitive function. 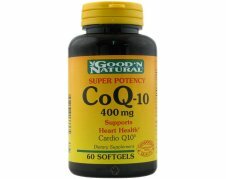 CoQ-10 is an enzyme found in all cells of the body. It occurs naturally, and is the co-factor in the electron transport chain between cells. If is is lacking, the body's most important source of cellular energy is depleted, and many medical conditions are aggravated. It is most concentrated in the heart and liver, and is a vital component in the mitochondria, the body's metabolic factories. It is a powerful antioxidant, scavenging free radicals, sitting in the membranes with Vitamin E which it recycles to keep it most active.